The security officer licence linked qualification is perfect for anyone wishing to work in manned security services. This course meets the SIA standards for learning and qualifications allowing you to attain all the necessary knowledge and skills required prior to applying for a security officer SIA licence. The security guard course will cover topics like the roles and responsibilities of a security officer, patrols, alarm systems, communication, incident reports and record-keeping, conflict management, risk reduction and loss provention. What do the SIA do? How much is the licence? All SIA licences cost £220 and you’ll have to renew it every 3 years. 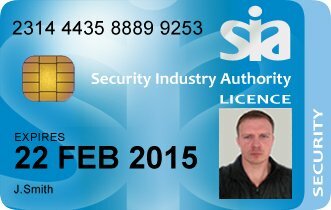 If you apply for a second licence in a different licensable role you will only be required to pay £110 e.g you have a current security guard licence and you apply for a additional CCTV licence; the additonal SIA licence is half price. There is no maximum age restriction to holding an SIA licence. However you need to be at least 17 years of age to be enroled on the course. A grasp of the English language at level 1 or above is also a mandatory requirement. Once you have completed and passed your security officer course you can apply for your SIA licence and begin looking for work in the Private Security Industry. You may also be interested in further training to increase your employment opportunities. The Level 2 Award for Working as a CCTV Operator (Public Space Surveillance) is a great counterpart to the security officer qualification as the roles often overlap. How long is the security guard course? This qualification must be taken over a minimum of 3-days. Assessed by a multiple-choice examination of 1-hour containing 40-questions. Learners must achieve a score of at least 28 out of 40 to pass this unit. Assessed by a multiple-choice examination of 1-hour consisting of 40-questions. Learners must achieve a score of at least 28 out of 40 to pass this unit. Assessed by a multiple-choice examination of 30-minutes consisting of 20-questions. Learners must achieve a score of at least 14 out of 20 to pass this unit. We may offer Close Protection and CVIT courses with our respected partners from time to time, Contact Us for more info.